With a physique reminiscent of their lobster relatives, crayfish are widespread across North American fresh water environments from fast flowing streams to lakes, ponds and sloughs. 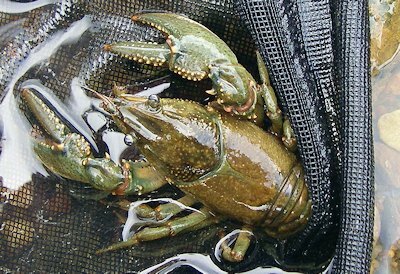 The largest crayfish concentrations can be found in the Midwest and Great Lakes regions. The only area not well represented by one or more of the 300 species spread across the continent is the Rocky Mountain region. Amongst some trout fisherman crayfish are not typically considered a presentation option and are often under utilized in many circles. Seasoned anglers who have been exposed to crayfish magic either through their trout experiences or by chasing other species such as smallmouth on the fly know the value of crayfish. Crayfish are a high protein big fish pattern that all fly fishers should be familiar with, on both rivers and lakes, no matter the fish species being pursued. Crayfish grow quickly and average about 4 inches at maturity depending upon individual species, larger specimens are possible. The Tasmanian Crayfish is a monster weighing in at 8 pounds and close to 15 inches. 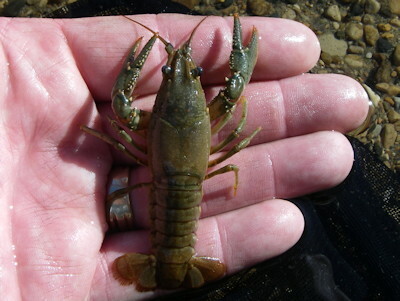 Brown trout, smallmouth bass, carp and other crayfish predators show a preference for smaller immature crayfish between 1 inch and 2.5 inches and are best imitated on long shank hooks ranging from sizes 2 through 10. Members of the crustacean family, crayfish resemble miniature versions of their saltwater lobster cousins. The characteristic fused head and thorax is known as a cephalothorax and the eyes and 2 pairs of antenna are located at the tip of the head area. Crayfish eyes located on moveable stalks are always on the look out for both predators and prey. Crayfish have 4 pairs of legs and a prominent set of pinchers once mature. Smaller immature crayfish feature small undeveloped claws and are obviously more palatable from a predator’s perspective. Should a crayfish loose an appendage they are capable of regeneration. When foraging or moving about crayfish seem to tip toe forward and are capable of scurrying along the bottom at a decent pace. Crayfish legs are put to use to investigate between rocks and other likely areas for food. When facing a threat crayfish typically scurry away. If this tactic fails startled crayfish change direction backing away from the danger, claws raised in an aggressive defensive posture. This is common with mature males. If the threat proves too much fleeing crayfish scoot backwards in 1 to 3 foot bursts using rapid undulations of their muscular tail and paddle-like telson, pinchers trailing behind, a trait immature and female crayfish put to good use. Smaller immature crayfish tend to move away from trouble using a combined pincher leg paddling motion suggesting the "tail wag" escape tactic develops as the crayfish grows, an interesting consideration when imitating juvenile crayfish. 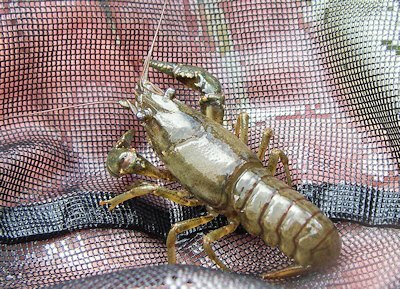 Fly fishers should consider imitating startled verses defensive crayfish in both their presentation kit bag and fly selection, a fleeing crayfish moving away at pace triggers a natural aggressive strike response from a fish. For years a brown Wooly Bugger has been a long standing imitation of a fleeing crayfish and still works today. Soft mobile materials such as marabou, muskrat and rabbit are recommended pincher choices for imitation. Crayfish coloration is as varied as their environments. Common colors schemes include mottled brown, olive and reddish brown. Fly patterns should mimic this color range and local inhabitants should be collected and observed to ensure accuracy. While speaking at a recent seminar in stillwater Saskatchewan the casting pond was alive with large crayfish basking on the large boulders ringing the shoreline. These particular crayfish featured beautiful contrasting blue claws. 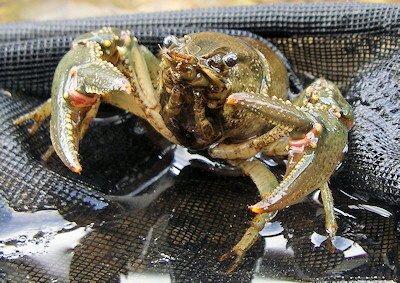 Immature specimens of some species such as the Papershell Crayfish are often translucent darkening as they grow and mature. During their on average 2 year life cycle crayfish undergo a series of moults, as many as 6-10 times during their first year. This pace slows during a crayfish’s second year. In the days preceding a moult a crayfish’s activity slows considerably. Calcium is drawn from the soon be shed exoskeletons and is stored within gastroliths contained within the thorax region. It is common for a recently moulted crayfish to consume its previous shell as a source of calcium to reinforce their new exoskeleton. Moulting crayfish are much paler for about a week until the new exoskeleton hardens and are a favored prey item for many fish species, selecting them over other non moulting crayfish. Fly pattern color choices should factor in the paler coloration of freshly crayfish. 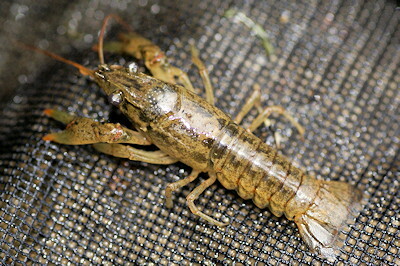 Many seasoned crayfish fly fishers favor paler "shedder" crayfish imitations. Although capable in living in a diversity of habitats, crayfish prefer calcium rich waters rubble bottoms and areas of vegetation for camouflage and concealment. Calcium as with all crustaceans is a key component for exoskeleton development. I recall fishing the upper Credit River in Ontario. As we waded in search of browns it was amazing at the number of crayfish we accidentally kicked loose as we stumbled amongst the riffles and rock gardens. An embarrassing glance at my fly box revealed little in the way of crayfish impostors. Bottom bouncing crayfish imitations dead drift using a floating line, 9-12 foot leader and if needed or desired a strike indicator and split shot, under such conditions is a deadly tactic. Lake and pond crayfish show a preference for shoreline margins. Dumbbell eyes are common pattern features on both river and lake to flip the pattern hook point up while tipping the suggestive claws up and enabling the angler to creep the pattern over the bottom cobble relatively snag free. Ardent crayfish fly fishers and pattern designers such as Grand River Troutfitters Ken Collins have spend countless hours, including time beneath the water, perfecting their crayfish imitations. To suggest a fleeing or foraging crayfish sinking lines are often preferred to allow for a horizontal presentation path. Preferred retrieves include 4-6 inch strip retrieves with pauses that allow the fly to sink back down to the bottom. To suggest a foraging crayfish use a slow handtwist retrieve to creep and skip the fly above the bottom. Takes can be subtle with this method so set the hook on anything that seems suspicious. Another presentation method involves quartering the cast cross current and mending the line upstream permitting the fly to sink near the bottom. Once sunk allow the current to drag the line and pattern down stream, remember crayfish are not strong enough to move upstream. Allow the fly to swing into the shallows. At the end of the swing creep and twitch the fly back upstream before recasting. Takes often occur as the fly sweeps into the shallows. During the retrieve pitch the rod tip and add strategic strips during the swing. Don’t be surprised by aggressive takes when using crayfish patterns as many fish crush and masticate crayfish prior to swallowing them. As water temperature rises so does crayfish activity. Conversely when the thermostat dips to the lower 40’s crayfish activity draws to a standstill. During the winter crayfish burrow themselves into the bottom or under rocks to avoid cooler temperatures, in some instances burying themselves down over 6 inches. On rivers and streams winter and the subsequent spring run off period is tough on crayfish helping to keep population explosions in check. Crayfish typically mate during the fall months with the offspring hatching during the early spring. Females carry the fertilized eggs beneath their legs and at first glance resemble a ball of small split shot. As the eggs mature they become more translucent until they hatch anywhere from 2-20 weeks depending upon water temperature. Gravid females are often referred to as "in berry" owing to the berry-like appearance of the egg cluster. Once hatched the new born crayfish remain attached to the female until their second molt venturing off soon after to grow and mature on their own. Mature crayfish prefer to forage in low light conditions such as morning or evening hours or under overcast skies. This trait makes crayfish patterns the perfect choice for nocturnal brown trout. Immature crayfish tend to be more reclusive in nature and are not as easily observed although they do apt to be more active during daylight hours, not yet educated through experience to forage under low light conditions. Opportunistic feeders, crayfish dine on a wide spectrum of items from vegetation to carrion including living prey. During a recent dragon fly emergence I observed a large crayfish scuttling amongst the plodding nymphs in the near shore shallows taking full advantage of this protein rich food source. Obviously foraging crayfish expose themselves to danger making crayfish patterns an ideal presentation choice to start the day with or when exploring new waters.